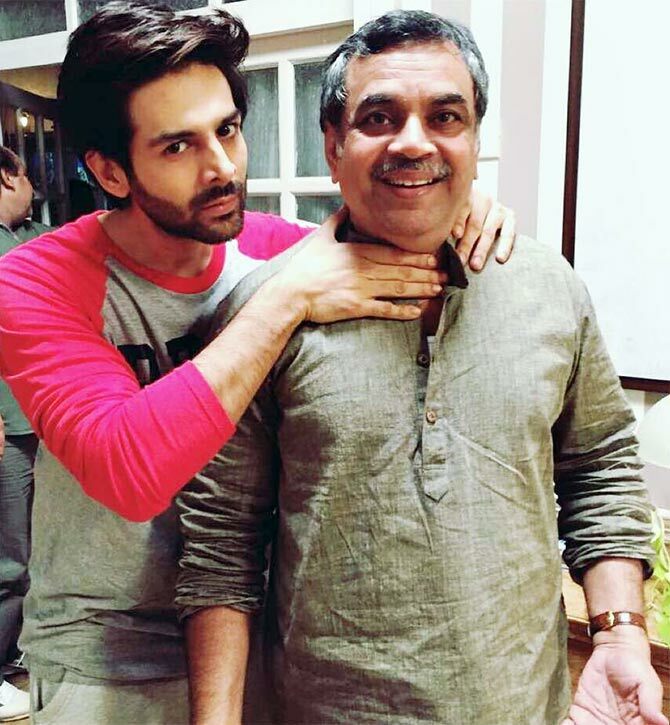 Actor Kartik Aaryan is pleased as punch to star opposite the towering Paresh Rawal. They share chemistry and comedy in their new film, Guest Iin London. Kartik, who shot to fame with the Pyaar Ka Punchnama movies, tells Rajul Hegde about how he has gone from sharing a flat with 12 other struggling actors to owning a BMW! IMAGE: Kartik Aaryan and Paresh Rawal in Guest Iin London. The Guest Iin London trailer received good reviews. People have said the comic timing and equation of Pareshji and me in the trailer reminds them of the on screen equation shared by Akshay Kumar and Pareshji in many of their films. I look up to Akshayji and Pareshji. I have grown up watching their films. They have incredible comic timing. You get to learn so much by just watching them. I like the fact that people think I am a funny guy and can make them laugh. I don't want to change that image. I love what I do and love being part of comedy films. It's important to have an image in the industry before you start breaking any kind of stereotype. I am a fan of comedy movies that one can watch with family and friends. I am careful with my film choices, as I am in an early stage of my career. That's why I took a lot of time after Pyaar Ka Punchnama 2 (which released in 2015) to decide my next film. I got many offers, but I was waiting for the right one. After the success of Punchnama 2, directors and producers started thinking I was choosey, but I don't mind being one. I got to do a film with Pareshji. What was working with Paresh Rawal like? He is a brilliant actor and an even better co-actor. He is a funny guy. It was a great learning experience. Now, he has become my bestie and my 4 am friend. I have the maximum scenes with him in the film, so the director (Ashwini Dhir) wanted us to bond well. Pareshji always treated me like a friend, and that's why I was so comfortable with him. We first met during the reading session. He told me he loved me in Pyar Ka Punchanam. When he appreciated me for my comic timing, it was perhaps one of the best compliments I have received as an actor. I did not have the words to tell him how much I love his work. After pack-up, we would chat, just like two friends. He would also accompany me for shopping! Are you funny in real life too? I would like to believe that I am witty and sarcastic (laughs). It's natural to draw inputs from your life experiences. I think the characters I play are close to my personality. IMAGE: Kartik with Nushrat Bharucha in Pyaar Ka Punchnama 2. Did you share a good equation with your other co-actors Kriti Kharbanda and Tanvi Azmi as well? I have a good chemistry with Kriti; we did not have to break the ice. We hit it off from Day One. I have been watching Tanviji's films from my school days. I thought she would be a serious person, but she is so funny. She did not leave an opportunity to pull my leg. I would love to play an anti-hero like Shah Rukh Khan in Baazigar. It would be interesting if somebody casts me as a grey character. Comedy is the most difficult genre to pull off, but grey shades would be interesting for me. There would be a lot of layers to it. I am doing a film with Punchnama director Luv Ranjan, Sonu Ka Titu Ki Sweety. I am training under fitness expert Prashant Sawant (who trains Bollywood stars like Shah Rukh Khan, Varun Dhawan and Sunny Leone). I am building an athletic body as I have some bare body scenes in the film. Earlier, my body was thin with a visible tummy. I am thankful to Prashant for this amazing transformation. My parents are doctors in Gwalior and they probably thought I would become one too. But I always wanted to be an actor. When I came to Mumbai to pursue a degree in engineering, I spent more time on auditions and acting classes. But nobody in my family knew that. I would take a train from Navi Mumbai to Andheri (north-west Mumbai), wash my face at the railway station washrooms and then go for auditions. I stumbled upon a Facebook post for Pyaar Ka Punchnama auditions. It finally happened after six months. During the making of Pyaar Ka Punchnama, it was a hand-to-mouth situation. I would pay the rent from my pocket money. I shared a two bedroom apartment with 12 guys. My parents were paying the fees for my engineering college, and I did not want to burden them more. If I had asked them, they would have helped me. I lived on vada pav and nimbu pani. After the film, I stayed with a relative for a few months and later shifted to an apartment. Did you buy the apartment? No. But recently, I bought a black BMW (smiles). I dream of buying a house in Bandstand (in Bandra, northwest Mumbai, where superstars Shah Rukh Khan and Salman Khan live). (Laughs).